TDS AND SENATORS have made close to 5,000 representations to the Passport Office on behalf of their constituents seeking passports in the last two years. One minister has made close to 200 in the last two years. The Department of Foreign Affairs currently has a dedicated channel of communication for politicians and the Passport Office and is the dedicated point of contact for all representatives. The system was established in the mid-90s, when there were long queues outside the passport offices in Dublin and Cork. The practice of politicians making representations for individuals applying for passports has been criticised in the past, with talk of discontinuing the system of fast-tracking passport applications in 2008. This followed on from controversy surrounding the then Taoiseach’s involvement in helping a businessman obtain a passport. 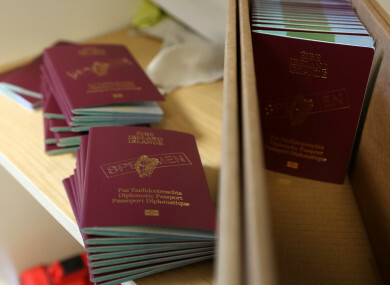 At the time, Foreign Affairs Minister Dermot Ahern ordered a full review of the system under which politicians could fast-track passport applications for constituents. However, the system is still in place. The information released to TheJournal.ie under the Freedom of Information Act, shows that six TDs have made between 100 to 200 representations in the last two years. Minister for Justice Charlie Flanagan has made the most representations. Last year the Passport Office received 163 from the Cabinet minister, while up until the 27 April 33 had been received, totalling 196. Fianna Fáil’s Pat the Cope Gallagher follows, having made 167 representations in the last two years – 112 in 2017 and 55 so far this year. Minister for Rural and Community Development Michael Ring made 94 in 2017 and 39 this year, totalling 133. Fianna Fáil’s new deputy leader Dara Calleary has made a total of 130 representations. He made 96 representations on behalf of individuals last year and 34 this year to the end of April. Donegal TD and Fianna Fáil TD Charlie McConalogue has made 115 representations – 79 last year and 39 this year. Kerry TD Michael Healy-Rae made close to 100 representations – 52 last year and 47 this year. Taoiseach Leo Varadkar has made a total of 49 in the last two years – 23 in 2017 and 26 so far this year. While a number of politicians were contacted for comment in relation to their figures, only Dara Calleary and Pat ‘The Cope’ Gallagher responded. Calleary told TheJournal.ie that he gets queries all year around in relation to passports. “People contact us in relation to passports for last minute family events, holidays, business trips etc. “Our proximity to Ireland West Airport Knock and our physical distance from the passport office in Dublin are significant factors in the volume of passport related queries we get,” he said. Gallagher said that since Brexit, there has been greater demand on his office to help out with passport applications. “We, in turn, make representations on their behalf. We are not looking for any favourtism, it should be noted,” he said. “All in all, it is a good system,” he added. It is not only TDs that can make representations, members of the Seanad can to. The senator most representations in the last two years is presidential hopeful, Gerard Craughwell. Since 2017, he has made 76. This is followed by Senator Robbie Galleagher who has made 46, Senator Paddy Burke, who has made 40, and Senator Pádraig Mac Lochlainn who has made 39 in the last two years. Over the last two years, senators have made 537 representations on behalf of individuals, while TDs have made 3,953. In total, Irish politicians have made 4,490 representations to the Passport Office since 2017. Senators who have made under three representations include, Maire Devine, Michael McDowell, Catherine Noonan, David Norris Mary Louise O’Donnell, Grace Sullivan, James Reilly, Lynn Ruane, and Fintan Warfield. The Department of Foreign Affairs said in a statement that the dedicated channel of communication between Oireachtas members and the Passport Office is via the department. It said this system “ensures consistency, efficiency and fairness” in responses to the queries of all public representatives. Staff in the Passport Service in Mount Street, Dublin, handle correspondence from Oireachtas representatives, forwarded by the Minister’s office, alongside correspondence from the Passport Services’ other communication channels. Email “Politicians made nearly 5,000 representations to the Passport Office on behalf of their constituents”. Feedback on “Politicians made nearly 5,000 representations to the Passport Office on behalf of their constituents”.